Dark City, Alex Proyas’s 1998 follow-up to his legendary The Crow, is an ambitious, overfull classic in its own right. I had not seen it since it was a new release on VHS, and wondered about how well it would hold up twenty years on. It did not disappoint. Dark City remains gorgeously noir, infused with cyberpunk and steampunk elements as well as touches of horror and romance. Although its inspirations are often obvious, it twists them together into an ambitious homage that provided its own inspiration to later films. The story moves at a fast pace, opening in the middle of a mystery and immediately taking a series of sharp, strange turns. The only difficulty I have with it is a too-sentimental conclusion. John Murdoch wakes up in an unfamiliar apartment with no memory of who he is or how he got there. He doesn’t know the murdered woman he stumbles over, or who the people chasing him are. With the help of a mysterious psychiatrist, Murdoch begins to piece together what has happened to him. He discovers that the world is run by the Strangers, alien creatures who inhabit dead humans and psychically control the city and everyone in it. The Strangers reconfigure the physical world every night–and the population, as well. People are changed out for each other, their memories stolen and reassigned, their social roles and relationships altered. It is all a grand experiment. The Strangers want to understand what it is to be human. But part of the experiment has gone wrong, and now Murdoch has the same psychic powers as the Strangers. Proyas’s highly stylized vision is a wonder to behold. The effects are familiar now because they have been used in many films since (most notably The Matrix, which even filmed on some of the sets used in Dark City, and Inception–I’d even say Doctor Strange felt its influence). But they are still effective, and carry the story along rather than overwhelming it. Beside the special-effect wonders of a city in motion through frangible time and space, more traditional techniques are just as vital to the film’s style. This is where the impact of film noir on Proyas’s work truly shows. Lighting is used to great dramatic effect, with fragments of jewel tones standing out sharply from the dull, dark world, mimicking the bright fragments of memory the characters try to hold on to. Light is constantly framed and limited by swallowing darkness. The smoky nightclub, the shadowy pool, the bright but dingy automat all contribute to the interplay between the seen and unseen. With the exception of Rufus Sewell’s John Murdoch and Colin Friels’s Detective Walenski, the performances are all also highly stylized in a way that highlights the unreality of the situation. Kiefer Sutherland’s Doctor Schreber already knows what is going on, and he is played with a strange, strained, out of breath speech pattern that manages to convey the moral agony of the man. Jennifer Connelly’s Emma is acted entirely at a remove, as if her very real passions were being felt from a distance. William Hurt’s Inspector Bumstead shares Emma’s distant affect, with the undercurrent of knowing there is more to his life but unable to remember it. But the Strangers are the most stylized of all. Visually, the alien hosts are constructed from a multitude of cultural references, from Nosferatu to Bat Boy, with a dash of the dying, unhelmeted Darth Vader for good measure. Their physical sameness reinforces the idea of the insectile hive mind driving them. 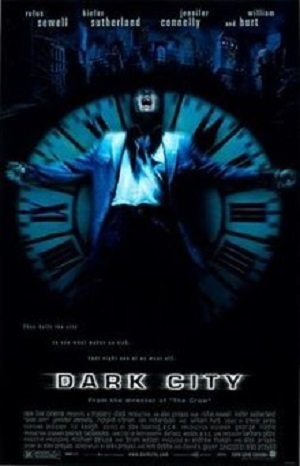 Dark City won both the Saturn and Bram Stoker Awards in 1998, and was nominated for the Hugo. But then it sort of slipped away from wider recognition. It barely earned back its production cost, but the film’s lack of box-office success belies its resonance. While hardly the first film to present a world where reality is an illusion, Dark City did it with an emotional center that still connects.